"How to Close the Social-Emotional Gap in Teacher Training"
Donahue-Keegan, D. (2013). Social-Emotional Learning (SEL) and Educator Preparation: Making the Case for Explicit Integration of SEL in Massachusetts’ Professional Standards for Teachers. A position paper submitted to the Office of Educator Policy, Preparation and Leadership, Massachusetts Department of Elementary and Secondary Education (DESE), on June 5, 2013. Engaged teaching recognizes that educators need to offer more than lesson plans and assessments for students to thrive in the 21st century. Equip your students to be resilient individuals, able to communicate effectively and work with diverse people. The authors contend that students must develop their emotional and social skills as thoroughly as their academic skills, and that teachers must cultivate this growth. This unique collection of chapters takes the reader on a tour to explore innovative preservice and inservice teacher education practices from many regions of the United States, Canada and the world. Each of the chapters offers an authentic, documentary account of successful initiatives that break the traditional mold of teacher education. Brown, P. H., Corrigan, M. W., & Higgins-D’Alessandro, A. (Eds.). (2012). Handbook of prosocial education (Volumes 1 & 2). New York: Rowman & Littlefield Publishers, Inc.
Durlak, J. A., Domitrovich, C. E., Weissberg, R. P., & Gullotta, T. P. (in press). The handbook of social and emotional learning: Research and practice. New York: Guilford Press. Humphrey, N. (2013). Social and emotional learning: A critical appraisal. Washington, DC: Sage. Weaver, L., & Wilder, M. (2013). 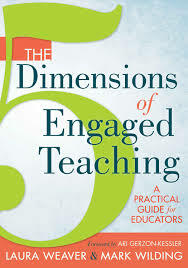 The 5 dimensions of engaged teaching: A practical guide for educators. Bloomington, IN: Solution Tree Press. Zins, J. E., Weissberg, R. P., Wang, M. C., & Walberg. H. J. (Eds.). (2004). Building academic success on social and emotional learning: What does the research say? New York: Teachers College Press. Brackett, M. Reyes, M., Rivers, S., Elbertson, N. & Salovey, P. (2012). Assessing Teachers’ Beliefs About Social and Emotional Learning. Journal of Psychoeducational Assessment, 30(3), pp. 219-236. Sage Publicatiions. Brackett, M.A., & Kremenitzer, J.P. (Eds). (2011). Creating Emotionally Literate Classrooms. Port Chester, New York : National Professional Resources. Brackett, M.A., Reyes, M.R., Rivers, S.E., Elbertson, N.A., & Salovey, P. (2011). Assessing teachers' beliefs about social and emotional learning. Journal of Psychoeducational Assessment, 30(3), 219-236. Brackett, M., Rivers, S. & Salovey, P. (2011). Emotional Intelligence: Implications for Personal, Social, Academic, and Workplace Success. Social and Personality Psychology Compass, 5, 88-103. Brackett, M., Reyes, M. Rivers, S. Elbertson, N. & Salovey, P. (2011). Classroom Emotional Climate, Teacher Affiliation, and Student Conduct. Journal of Classroom Interaction, 46 (1), pp. 27-36. Bridgeland, J., Bruce, M. & Hariharan, A. (2013). The Missing Piece: A National Teacher Survey on How Social and Emotional Learning Can Empower Children and Transform Schools. By Civic Enterprises, with Peter D. Hart Research Associates, for the Collaborative for Academic, Social and Emotional Learning (CASEL), May 2013. Bronfenbrenner, U. & Morris, P. A. (1998). The ecology of developmental processes. In W. Damon & R. M. Lerner (Eds. ), Handbook of child psychology, Vol. 1: Theoretical models of human development (5th ed., pp. 993-1023). NY: John Wiley and Sons, Inc.
Brooks, R. & Goldstein, S. (2008). The Mindset of Teachers Capable of Fostering Resilience in Students. Canadian Journal of School Psychology, 23 (114), pp. 114-126. Sage Publications, on behalf of Canadian Association of School Psychologists. Charney, R., Crawford, L. & Wood, C. (1999). The Development of Responsibility in Early Adolescence: Approaches to Social and Emotional Learning in the Middle School, In Cohen, J., (ed. ), Educating Minds and Hearts: Social Emotional Learning and the Passage into Adolescence. New York: Teachers College Press. Cohan, A. & Honigsfeld, A. (Eds.) (2011). Breaking the Mold of Pre-Service and In-Service Teacher Education). Lanham, Maryland: R & L Education. Cohen, J., Pickeral, T. and McCloskey, M. “The Challenge of Assessing School Climate,” Educational Leadership, December 2008/January 2009 | Volume 66 | Number 4. Cohen, J. (2006). Social, Emotional, Ethical, and Academic Education: Creating a Climate for Learning, Participation in Democracy, and Well-Being. Cambridge, MA: Harvard Educational Review, 76:2. Collie, R.J.; Shapka, J.D. ; Perry, N.E. (2012). School climate and social–emotional learning: Predicting teacher stress, job satisfaction, and teaching efficacy. Journal of Educational Psychology, Vol 104(4), Nov 2012, 1189-1204. Commission on Standards and Performance Reporting, Council for the Accreditation of Educator Preparation (CAEP), Draft Standards for public comment (February 22-March 29, 2013). Cozolino, L. (2013). The Social Neuroscience of Education: Optimizing Attachment & Learning in the Classroom. Forward by Daniel J. Siegel. New York: W.W. Norton & Co.
Collaborative for Academic, Social, and Emotional Learning (CASEL). http://www.CASEL.org. Curby, T., Brock, L., Hamre, B. (2013). Teachers’ Emotional Support Consistency Predicts Children’s Achievement Gains and Social Skills. Early Education and Development, 24: 292-309. Taylor & Francis Group, LLC. Darling-Hammond, L. (2010). Teacher Education and the American Future. Journal of Teacher Education, American Association of Colleges for Teacher Education, 61(1-2), pp. 35-37. Domitrovich, C. E., Gest, S. D., Gill, S., Bierman, K. L., Welsh, J. A., & Jones, D. J. (2009). Fostering high quality teaching with an enriched curriculum and professional development: Head Start REDI. American Educational Research Journal, 46, 567–597. and passion for long-term goals. Journal of Personality and Social Psychology, 92(6),1087-1101. Durlak, J.A., Weissberg, R.P., Dymnicki, A.B., Taylor, R.D. & Schellinger, K.B. (2011). The impact of enhancing students’ social and emotional learning: A meta‐analysis of school‐based universal interventions. Child Development, 82 (1), 405‐432. Elbertson, N., Brackett, M., & Weissberg, R. (2010). School-Based Social and Emotional Learning (SEL) Programming: Current Perspectives. A. Hargreaves et al. (eds), Second International Handbook of Educational Change, Springer International Handbooks of Education 23, pp. 1017-1028. Elias, M. (2012). Leading the Way in Social, Emotional, and Character Development Standards. Edutopia, http://www.edutopia.org/blog/secd-standards-kansas-maurice-elias, May 14, 2013. Fleming, J. & Bay, Mary (2004). Social and Emotional Learning in Teacher Preparation Standards, in Zins et al. (eds), Building Academic Success on Social and Emotoinal Learning: What Does the Research Say? pp. 94-110. New York, NY: Teachers College Press. Fleming, J., and Bay, M. (2001). Social and Emotional Learning in Teacher Preparation Standards: A Comparison of SEL Competencies to Teaching Standards. CEIC Review, 10, 6, 14-15. Gordon, R., Ji, P., Mulhall, P., Shaw, B., Weissberg, R. P. (2011). Social and Emotional Learning for Illinois Students: Policy, Practice and Progress (PDF). The Illinois Report 2011, Institute of Government & Public Affairs at the University of Illinois, Urbana-Champaign, Chicago, and Springfield. Hargreaves, A. (1998). The emotional practice of teaching. Teaching and Teacher Education, 14(8), pp. 835-854. Houck, J. W., Cohn, K. C., & Cohn, C. A. (2004). Partnering to lead educational renewal: High- quality teachers, high-quality schools. New York, NY: Teachers College Press. Immordino-Yang, MH and Damasio, A. (2007). We Feel, Therefore We Learn: The Relevance of Affective and Social Neuroscience to Education. International Mind, Brain, and Education Society Journal, Volume 1 – Number 1; Blackwell Publishing, Inc.
Jennings, P. A., Snowberg, K. E., Coccia. M. A., & Greenberg, M. T. (2011). Improving classroom learning environments by Cultivating Awareness and Resilience in Education (CARE): Results of two pilot studies. Journal of Classroom Interaction, 46(1), 37–48. Jennings, P. A. (2011). Promoting teachers’ social and emotional competencies to support performance and reduce burnout. Chapter 13 in A. Cohan & A. Honigsfeld (Eds. ), Breaking the mold of preservice and inservice teacher education: Innovative and successful practices for the twenty-first century (pp. 133–143). New York: Rowman & Littlefield. Jones, S., Bouffard, S., & Weissbourd, R. (2013). Educators’ social and emotional skills vital to learning. Phi Delta Kappan, volume 94, Number 3, May 2013. Jones, S. & Bouffard, S. (2012). Social and Emotional Learning in Schools: From Programs to Strategies, in SRCD Social Policy Report, volume 26, number 4, pp. 1-32. Kremenitzer, J.P ., Mojsa, J.K., & Brackett, M.A.(2012). Creating an emotionally intelligent classroom culture. In Emotional Intelligence: Theoretical and cultural perspectives. Emmerling, R., Shanwal, V.K., & Mandal, M.K (Eds) Hauppauge, NY: Nova Science Publishers. Ladson-Billings, G. 2001. Crossing Over to Canaan: The Journey of New Teachers in Diverse Classrooms. San Francisco: Jossey-Bass. Lopes, P. & Salovey, P. (2001). Emotional Intelligence and Social-Emotional Learning: Assessing Emotional Intelligence and Developing Skills and Flexibility. CEIC Review, 10, 6, 12-13. MacDonald, E. & Shirley, D. (2009). The Mindful Teacher. New York, NY: Teachers College Press. Marzano, R. J. (2003). What Works in Schools: Translating Research into Action Alexandria, VA: ASCD. Massachusetts Department of Elementary and Secondary Education (2011). Guidelines on Implementing Social and Emotional Learning (SEL) Curricula, August 2011. National Institute of Child Health and Human Development (NICHD) & the National Council for Accreditation of Teacher Education (NCATE) (2007). Child and Adolescent Development Research and Teacher Education: Evidence-based Pedagogy, Policy, and Practice. A Summary of Roundtable Meetings. National Research Council. (2010). Preparing teachers: Building evidence for sound policy. Retrieved from http://www.nap.edu/catalog. php?record_id=12882, 180. Noddings, N. (2005). ‘Caring in education’ – the encyclopedia of informal education. http://infed.org/mobi/caring-in-education/ Retrieved: May 30, 2013. Schonert-Reichl, K. A., & Hymel, S. (2008). Educating the heart as well as the mind: Why social and emotional learning is critical for students school and life success. Education Canada, 47, 20-25. Shelton, C. & Stern, R. (2004). Understanding Emotions in the Classroom: Differentiating Teaching Strategies for Optimal Learning. Forward by Linda Lantieri. Port Chester, NY: Dude Publishing. Snyder, J. and Lit, I. (2010). Principles and Exemplars for Integrating Developmental Sciences Knowledge into Educator Preparation. Paper commissioned by the National Council for Accreditation of Teacher Education (NCATE). Soloway, G. B., Poulin, A. & Mackenzie, C. S. (2010). Preparing New Teachers for the Full Catastrophe of the 21st Century Classroom: Integrating Mindfulness Training into Initial Teacher Education. In A. Cohan & A. Honigsfeld (Eds. ), Breaking the Mold of Pre-Service and In-Service Teacher Education (pp. 219–227). Lanham, Maryland: R & L Education. Tilly, W. D. (2008). The evolution of school psychology to science-based practice: Problem solving and the three-tiered model (2008). In A. Thomas & J. Grimes (Eds. ), Best practices in school psychology, (pp. 17-36). Washington, DC: National Association of School Psychologists. Tobin, R. M., Schneider, W. J., Reck, S. G., & Landau, S. (2008). Best practices in the assessment of children with attention-deficit/hyperactivity disorder: Linking assessment to response-to-intervention. In A. Thomas & J. Grimes (Eds. ), Best Practices in School Psychology V (Vol. 2, pp. 617-632). Bethesda, MD: National Association of School Psychologists. Watson, B. & Leibbrand, J. (2010). Brief: summary of Principles and Exemplars for Integrating Developmental Sciences Knowledge into Educator Preparation. Paper commissioned by the National Council for Accreditation of Teacher Education (NCATE). Wentzel, K. R., & Caldwell, K. (1997). Friendships, peer acceptance, and group membership: Relations to academic achievement in middle school. Child Development, 68, 1198-1209. Willingham, D. (2009). Why Don't Students Like School: A Cognitive Scientist Answers Questions About How the Mind Works and What It Means for the Classroom. San Francisco, CA: Jossey-Bass. Yosso, T. (2005). Whose culture has capital? A critical race theory discussion of community cultural wealth. Race, Ethnicity and Education, 8(1), March 2001, pp. 69-91. Taylor & Francis Group Ltd.